One question we hear often from people considering a bicycle tour of Italy or Sicily involves luggage. Actually, we hear many questions about it. What should I pack? How much can I bring? What will happen to it while I’m riding? 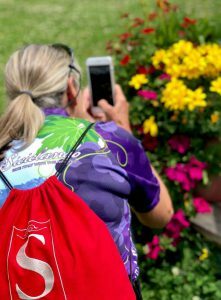 It’s normal to wonder about your belongings while you are on vacation, but when you book a spot on a custom or guided tour with Siciclando you can rest assured your luggage is in good hands. Whether you have planned to ride with a group on any of our tours through Sicily, Tuscany, or Northern Italy, or have a customized trip in mind, we will make all the arrangements to transfer your luggage between hotels, so everything you’ve brought will be waiting for you upon arrival at each nightly stop. As for what you should pack for such an amazing trip, it will depend on when you come and how you want to spend your free time. Comfort and safety are important when it comes to your cycling clothes. Biking shorts or tights with padding are available in a variety of styles at cycling and sporting goods stores, and will help you endure a long ride on a bicycle seat. Polyester socks, t-shirts and jerseys are best to wear while riding because they “breathe” – the material dries quickly as you sweat and you may also feel cooler. Siciclando provides helmets on request, but if you have your own you are certainly welcome to bring it. Depending on your tour, you’ll enjoy a scheduled dinner out or free time to explore your surroundings. Average temperatures in the spring and autumn months may range from the low 40s to the high 70s Fahrenheit. You may wish to include a light jacket or sweater along with one or two dress casual outfits for the evenings. Consider comfortable shoes appropriate for walking, in addition to shoes for cycling. If you have clip-on shoes, you may want to bring your pedals as well, which our guides can easily put on your rental bike. During peak summer months here, we enjoy many sunny, warm days, so if you come in June you will want to wear short sleeves. A biking tour of Sicily or Italy is a once in a lifetime trip that will hold many memories, and you want to look back on all of them with a smile. For our self-guided tours, our bikes come with rear wheel rack bags, and we provide some essential supplies, including a spare tube and repair kit, tire pump, bike lock, multi-use tool and a water bottle (which is yours to keep). Camera/mobile phone – You will take many pictures, we promise! Don’t forget to pack the necessary charging cords, too, so your battery doesn’t run down. Siciclando can provide phone support while you ride, too. Money – While some meals are included on our tours, there are some meals where you are independent. You may also want money to shop and enjoy a gelato or glass of wine out. Have some cash for small items, and before you leave on your trip, contact your credit card companies to let them know you are traveling overseas. Medications – If you require medication throughout the day, you can keep small bottles with you in the bike’s rack bag. Sunscreen – Even though we enjoy cool, comfortable weather here most months, you still need protection from the sun. Bring along a travel-size tube and use as needed. Adaptors – This is perhaps one of the most important essentials for international travel. If you need to recharge phones, you need an outlet adaptor. 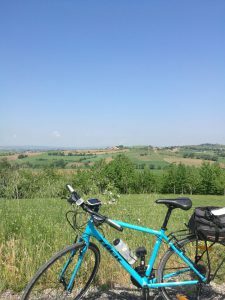 Have other questions about what to bring on your Italian cycling tour? Give us a call or send an email with your questions. Dates for our 2019 tours are opening now, so contact Siciclando today.